Tom Patterson grew up in the Adirondack Mountains of northern New York and graduated with a B.A. in geography from SUNY Oneonta. Seeking warmer climes, he received an M.A. in geography from the University of Hawaii at Manoa. Tom started his career teaching classes and serving as Cartography Laboratory Manager at the University of Utah. 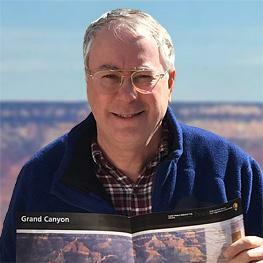 Most of his career was spent as a cartographer for the U.S. National Park Service, Harpers Ferry Center, retiring from there in 2018. Tom is a former president of the North American Cartographic Information Society (NACIS) and now serves as exectutive director of that organization. He is active in the ICA Commission on Mountain Cartography. Tom lives outside of Washington, D.C. in northern Virginia. Shaded relief is my major interest in cartography, which began when I was a graduate student at the University of Hawaii (UH) in 1980 working on an atlas of American Samoa. Needing shaded relief for the atlas and not having anyone in-house skilled with an airbrush or pencil, UH hired Michael Wood, University of Aberdeen, to do the work. A few months later a mailing tube arrived in Honolulu that influenced the course of my career. Inside was a sheet of drafting film covered with delicate graphite tones. Wood’s shaded relief depiction of the complex Samoan landscape with only modulated light and shadows was easy to understand—and beautiful. I was inspired to do similar work. After a couple of years’ practice, I developed a knack for relief drawing and a style of my own. This arcane craft that I practiced mostly as a hobby eventually landed me a job with National Park Service in 1992, just as digital production was first becoming practical—and soon much more. Digital techniques now allow me to create relief maps in ways that I previously only imagined, mimicking the work of the best cartographic artists of the late manual era, such as Heinrich Berann, Eduard Imhof, Erwin Raisz, and Hal Shelton. The 391 national park areas are an ideal testing ground for these techniques. I now work on many more types of maps, including bird’s-eye views of historical sites, animations, interactive exhibits, and solid terrain models. The idea of “cartographic realism” guides my approach to map design. When appropriate, and in moderation, I add natural environment effects to a map, effects that people are familiar with and find pleasing—sun glints on water, warm illumination, organic textures, and natural colors. The goal is to make a map that will attract and hold the attention of readers for as long as possible, encouraging visual exploration. This is what happened to me nearly three decades ago with Michael Wood’s shaded relief of Samoa.